All of our articles are written by our members. We welcome articles about any aspect of philately, so long as they are original with us and the author is a member of the Society. As the nation’s premier philatelic magazine and archival publication of choice, we attract many worthy manuscripts. We pay a $75 honorarium for feature articles, $50 for brief one-page articles. Payment is made upon publication. Please write your article in a conversational style and in first person. Keep in mind that you are telling a story to someone who is not necessarily a specialist in your field. Provide some background information so that readers can follow your discussion. Please be aware that generic websites such as Wikipedia are not reliable sources of factual information. When researching online please use primary sources whenever possible. DO NOT format the text when sending electronic files — use one font in regular, bold and italic. No centering or columns. Please refrain from using macro keys. Always spell out an acronym the first time you use it; add the abbreviation in parentheses (even if you think everyone should know that UPU stands for Universal Postal Union). DO NOT insert illustrations into your electronic text file. You may send your article as an e-mail attachment. We accept most word processing programs. We also can receive it on a CD/DVD. Send manuscripts to editor Martin Miller, The American Phil­atelist, 100 Match Factory Place, Bellefonte, PA 16823, or by e-mail to aparticle@stamps.org. The editorial staff reserves the right to edit all material accepted for publication. You will receive a copy of your edited article for review prior to publication. Please note: Submissions discovered to have been copied, either wholly or in part, from online sources such as Wikipedia or other print publications will be declined or returned to the author for reworking. Do not place figure references in the text as “Figure 1, Figure 2,” etc. Text should give a de­scription of the item but should not refer to it by figure number. Don’t forget to double-check your cat­alogue reference numbers, no matter which catalogue you are using, and especially if the stamp pictured is a variation. Provide a separate sheet with numbered figure captions. Lightly number photocopies, etc. in pencil or use sticky notes. DO NOT place sticky notes on orig­inal philatelic material, they can “lift” old ink or tear the item. While we prefer scans of the original stamps and covers to be illustrated in the magazine, high quality color photocopies usually reproduce well for COVERS ONLY, if the material is placed on a dark background. DO NOT photocopy or scan items while they are in their protective coverings or mounted on album pages. If you are not comfortable creating digital images of your philatelic material or you don't have a scanner, you may send your items to us. We will be happy to scan them for you. All original illustrative ma­terial will be re­turned by insured mail. Let us know what value you place on the material, so that it may be in­sured accordingly. And let us know if there is an urgent need for a quick return. Scanning vs digital photographs. Scanning produces much better images of stamps and covers. Scan each philatelic item individually. Remove your philatelic material from their protective covering — mounts, glassines, mylar sleeves, etc. Scanning your items inside a protective covering produces blurry images and sometimes may add a pattern to your image. Please do not attempt to create collages, overlapping images, inserts, etc. Do not worry about straightening, cropping, or color correcting your images. We handle all of those procedures during preparation for layout. Scanning stamps. The United States Postal Service and other postal agencies require that we illustrate stamps at 150% higher or 75% lower than the original size of the stamp. Scan your stamp illustrations at 600 dpi and 100% of their original size. Scan your covers at 75% of their original size and 300 dpi. If you do not own a computer or scanner, Kinkos, Staples, or Office Depot will scan your items for you. Place stamps and covers on a dark background. Foam core board is excellent for flattening curling items and providing a solid dark background. Foam core board can be purchased at any hobby store in a variety of color. It is also helpful to have a piece of white foam core board for those dark colored items. Another excellent product also available in hobby stores is Foam Zone. If you have to scan an item that has already been printed — a photo from a book, a postcard, a photocopy, etc. — rotate your item about 45 degrees on your scanner. This may help to diminish the moire effect — no guarantees. We do NOT accept images from the Internet or files that were created for a website, because they are usually 72 ppi which results in poor quality reproductions. Changing the resolution of the image after the scan may cause your image to lose sharpness especially if you are trying go from 72 dpi to 300 dpi. The image will become pixelated or look like Legos. A converted 72 dpi scan may look all right on your computer screen, but it will not work for us. Such images will be detected by printer are rejected. If you are creating a pdf file to send, make sure to select "Press Quality" from the drop down list of options. Please do not select "Standard." When sending files via e-mail, please check with your provider as to the handling of attachments. Some providers have restrictions on the size of an attachment. The AP can receive files to 9 MB in size. If your files are larger, please let us know. We can work with you to upload your files directly to us. When sending your manuscript and/or scans as e-mail attachments, please send a second message to let us know what you sent. Sometimes the message with the attachments never arrives. For illustrations — .jpg, .tif, .eps, press quality PDF. Remember, all illustrations must come as separate files. Don't forget to include a two- or three-sentence “bio-note” that includes your current collecting interests. This will be published with your article. 1. John L. Kay and Chester M. Smith Jr., New York Postal History: The Post Offices and First Postmasters from 1775 to 1980 (State College, PA: The American Philatelic Society; 1982), 23. 2. Albro T. Gaul, “Historic Philately Is Not Postal History,” The American Philatelist 104 (September 1990): 818–19. Publication of an article in the AP is under the standard terms of First North American Serial Rights. The contents of each issue of The American Philatelist are copyrighted in its own name each month. Authors retain the right to use all or part of their articles in future works of their own. 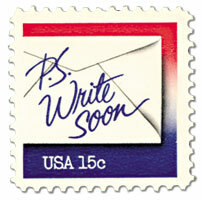 Oc­casionally we receive a request from a specialized newsletter to reprint articles from The American Philatelist. If the author gives permission, we typically will approve these requests. We ask only that printed acknowledgment be made to the article’s prior publication in The American Phil­atelist and that, when it appears, a copy is sent for our files.